We all have met with the insurance salesman and died a slow death as our eyes glazed over and our head wanted to hit the table. Or wished for the worst torture we could imagine just to get out of the meeting. Well prepare yourself for the latest and greatest torture technique to be developed since the dark ages, this one is worthy of the al Qaeda operatives and the like, better than water boarding. 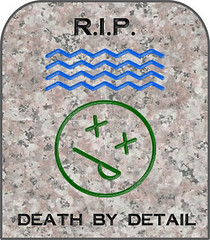 It’s what I call Death by Detail now offered by your local Loan Officer. This one sneaks up on you, seeming innocent in the beginning but slowly begins to pull you in little by little. Beware, it’s like the wood chipper ready to grab your sleeve and drag you in to its jaws. Just to make sure we are on the same page here, we are talking about the Loan process and the new lending guidelines. Somehow so cleverly designed they amaze at the time and forethought someone invested. Starting from the application and the full documentation of income and assets seems simple enough until the underwriter reviews your deposits and begins to pull apart your tranquility, one of my experiences involve the grandson that received $100 cash Christmas gift from his grandmother and promptly deposited to his bank. Since it was cash, the lender disallowed it and deducted it from his assets because there was no documentable proof of the gift. Or, the landlord that owned several rental properties and had a tenant or two that pay in cash. The landlord never discouraged it because we all know cash is king and no worries about bounced checks. Even though the income was claimed on his tax return, the lender disallowed the cash and deducted it from usable assets. Try transferring some funds, then find yourself documenting the old account or writing letters of explanation for a clerks misspelling of your name from 5 years ago when you applied for a store credit card or any other misspelling. Or, writing a Letter of Explanation for every credit inquiry for the last 6 month including the review done by your local bank on your account or credit card renewal. Or, explain why your income dropped from last year due to OT and Bonus Cuts. All in all, the detail is understandable if you look back at the fraud; easy lending, and the resulting foreclosures, short sales and economic down fall. The good news? There is money to lend. The Fannie Mae, Freddie Mac, VA, FHA and USDA programs are solid and helping to rebuild our economy one new refinance or sale at a time. Retention statistics are improving, and slowly improving the problem areas of over documentation. How about the best kept secret loan programs: $0 down and the closing costs can all be financed. USDA is alive and well, stable with great low rates. Same for the VA program. How about the FHA program with 3.5% down? And the Fannie or Freddie programs with as little as 3% down? If you’re thinking about buying or refinancing now is the time, we are seeing Real Estate prices rising again and sales are brisk. Rents are on the rise, yet you can buy investment property and have a positive cash flow. Assistance is freely given with the added paper work and hopefully, with a little understanding, we can lower the frustration level caused by the loan process. I can help you take advantage of the excellent opportunities available. Posted on February 4, 2013, in Finance and tagged al Qaeda, Assets, Bank, Bonus Cuts, Buy a Home, Buyer, Closing, Closing Costs, Death by Detail, Documentable, Fannie Mae, FHA, Finance Me, Foreclosure, Fort Myers, Fraud, Freddie Mac, Genesis Lending Group, http://www.kristenpell.com/idx/index.php, Income, Insurance salesman, Kara Holleran, Landlord, Lender, Loan, Loan Officer, Loan Process, Mortgage, OT, Proof of Gift, Property Guiding, Real Estate Financing, SWFL Real Estate, USDA, VA. Bookmark the permalink. Leave a comment.